I loved the theme ‘Windows Reflection’ as I knew essentially I would be taking two photos in one, the subject and the reflection. I guess like a lot of street photography is having that quick eye to see and capture that unique image and I saw this solitude gentleman in a coffee shop on Westmorland Street in Dublin, just looking out at the world going by. 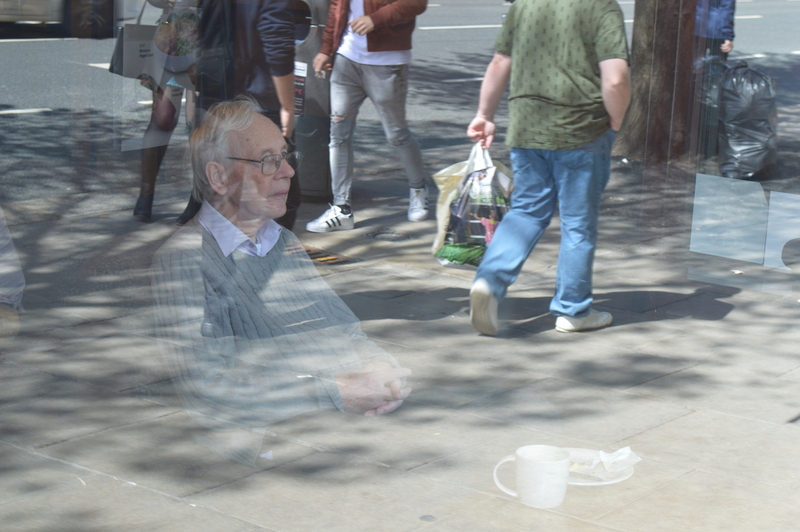 He didn’t move for about 20 seconds and so I was able to take lots of shots so I wanted to capture the busy people walking in the reflection. It was the perfect shot to make black and white which I feel added to the reflective, contemplative mood of the gentleman. I am relative new to street photography, having only taken up photography in 2015 and specifically street photography about a year ago. I have always had a passion for photographing people and particularly with street photography, I loved photographing faces, expressions and movements. I joined a local street photography group in Dublin early last year and in addition to meeting some cool people, has been a great learning experience seeing their shots of the same streets we walked down together.